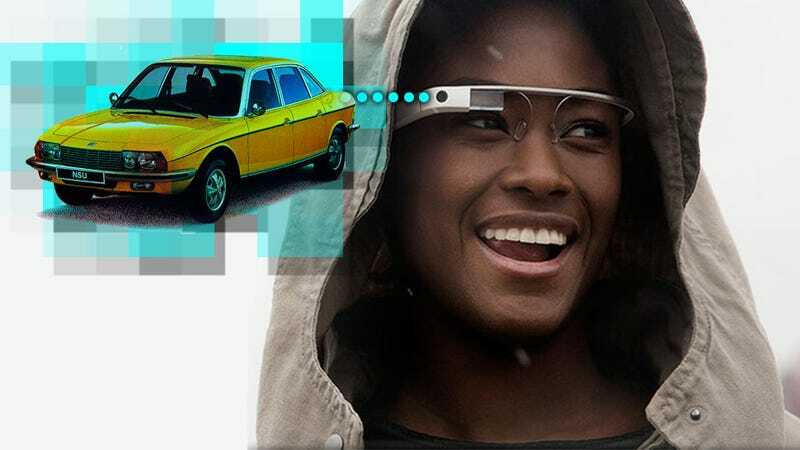 Sure, you'll probably look a bit like a tool wearing them, and West Virginia's already banned their use while driving, but even so I think Google Glass (Google's reality-augmenting spectacles project, for those unaware) can offer a great deal to car lovers, both while driving and otherwise. So far, I've got five reasons why. Also, why exactly is the West Virginia House wasting their time legislating something that doesn't even really exist yet? My wife grew up in West Virginia, and her family had a rotary phone well into the 1990s. So, if history's any indicator, I'm pretty sure West Virginia can relax before the armies of cybernetic drivers threaten to destroy their state. Also, while Google Glass is probably the most developed of these systems at the moment, I'm sure there will be all sorts of brands and types of these things eventually, and these concepts work as well for any sort of computer-enhanced visual system. Like the cheap, knock-off Sparkomatic Pince-Nez I'm likely to end up with. This is perhaps the feature I'm most excited to see happen, and the one that's actually been in use the longest by precursor systems. Essentially, it would be the glasses overlaying schematics and diagrams over your field of vision based on what you're looking at. So, if you're looking under your hood and at your engine, you could have superimposed over the engine the outlines and locations of parts that would normally be impossible to see. This would be especially handy for tracing various lines (hydraulic, fuel, water, etc) and wiring. In fact, Boeing has been using this type of thing in their aircraft manufature since the 1990s. Also, with electric and hybrid cars becoming more popular, it could save your life, as it could show you the location of the high-voltage lines before you plunge your drill right into them. Maybe you were planning on installing some sort of hideous spoiler, which would make the resulting shock a blessing, but I'll give you the benefit of the doubt. In fact, I can imagine that car service manuals would become downloads to your Google Glass or whatever, and might possibly have a registration sticker you'd put on your car to let the system orient itself, and properly map everything in its correct location. This could be a huge help for mechanics and hobbyists. The big problem I have with the West Virginia ban, aside from the fact that there's not really anything to ban yet, is that it assumes we're all absolute, irredeemable morons at the expense of everyone else. Sure, if someone's stupid enough to beam The Notebook directly into their eyes while driving, then, yeah, that's a problem, but physics will solve that issue soon enough. For the rest of the non-drooling-simpleton population, Google Glass could offer real safety benefits, ones that have been known ever since pilots started using heads-up displays. Data like speed and fuel levels could be unobtrusively in the field of vision, keeping eyes on the road, and the augmented-vision system could help compensate for poor visibility in bad weather or other extreme darkness. Using known GPS location, mapping data, and processing the visual images from the cameras, road surfaces and borders/dimensions could be displayed in the driver's field of vision, helping to keep them on the road and off of precipitous mountainsides or oncoming traffic. Applications designed to factor in visual and environmental factors could help alert drivers to surfaces likely to be icy or slick, and by talking to the car's network of sensors, drivers could be alerted to objects in blind spots much more effectively. Also, a car's rate of speed and environmental data could be used to give a dynamic visual indicator of things like stopping distance, helping drivers make better decisions when driving. You know how handy it is when you're playing SimRacing or Forza or whatever and the game shows you the ideal line to take through a corner? As you're learning to drive better in real life, these types of vision-enhancing systems could provide just that. Also, track maps so you can prepare for the turn ahead, time indicators, warnings about yellow or black flags, information about the condition of the car — all of these things could be right in the field of vision, so the driver's attention can remain on the track. We already live in an era where it's hard to get lost. When I look back at 1000-mile road trips I used to take with no phone and just a paper map and a willingness to read signs, it seems crazy now. Still, even with as good as modern GPS systems are, it's pretty much all but guaranteed that driving directions will be part of any enhanced-vision system. Google mentions it in their Google Glass promos themselves, because, duh, of course. You could have arrows showing you when and where to turn in real time right in your vision, and that right there seems like the holy grail of the whole art of Showing Someone How To Get Somewhere. Visual warning to tell you to get over into the correct lane for your exit, literal dotted lines to follow to get to where you need to be — come on, this is what GPS navigation should be. This isn't a feature I've heard anyone discuss much, but there's no reason why data and information on a particular car couldn't be loaded into your supercyberdataglasses and then when you actually go to check the car out, your glasses could help you spot modifications, missing parts, damaged areas, and more. You would know what to look for and where to look for it right there, with information updated in real-time. You could send back pictures to your own account to help you research and make your decision. This is an exciting time to be alive, and it has the potential to be a great time to love cars. Technology like this can enhance and improve the experiences of driving, owning, and working on a car. Technology isn't always about autonomous cars and moving further and further away from the simple mechanical dynamics of driving. Sometimes it can help you appreciate the fundamental things that drew you to cars in the first place, just a bit more effectively. So, sure, lock out movies and texts and web browsing while driving, but let's see what we can do with these tools in our cars before we ban them.